The neck contains seven bones, known as the cervical vertebrae. A “broken neck” means that one or more of these vertebrae have fractured. Cervical fractures, or neck fractures, are usually caused by high-energy traumas, such as car accidents or falls from heights. If you have suffered a broken neck, you may have severe neck pain. You may feel pain from your neck spreading to your shoulders or arms, and you might experience bruising and swelling on the back of your neck. It is vital to immediately seek medical treatment for a broken neck. Because the spinal cord runs through the neck vertebrae, neck fractures can be very serious injuries. If the spinal cord is damaged during the injuring event, the injury may result in paralysis or even death. 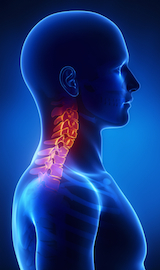 Depending on the severity of the fracture, a fractured neck may or may not require surgery. When an external force is applied to the spine and the spinal column is not able to support the force, the front part of the vertebrae in the spine may crush, resulting in a compression fracture. If the force is great, the entire vertebral column can break, which is called a burst fracture. Spinal fractures usually occur in the mid back and lower back areas. High-velocity accidents, such as car wrecks or serious falls, are the most common cause of spinal fractures. Interestingly, men suffer from mid or lower back fractures four times more often than women. If you have suffered a spinal fracture, you may experience moderate to severe back pain, usually made worse by attempts to move. If your injury was caused by a high-speed collision, you may have blacked-out or lost consciousness. If your spinal cord was also injured, there may be additional numbness, tingling, weakness, or bladder/bowel disfunction. Most spinal fractures can be treated with immobilization for up to twelve weeks, usually achieved through a brace or corset. If the injury is severe, though, surgery may be required. The exact treatment plan will depend on the type of fracture and any other injuries you suffered in the accident. After surgery or immobilization, rehabilitation will likely be required to get you as close as possible to your pre-injury mobility and strength. If you or someone you love has fractured their neck or spine in an accident, contact one of our award-winning attorneys for a no-cost, no-obligation review of your case. Call us any time at 615-742-4880 or toll-free at 866.812.8787 or fill out this online form and we will contact you. We handle all accident cases on a contingency basis which means we only get paid if we recover money for you. We have recovered well over $100 million dollars for our satisfied clients and we may be able to help you too.